System Notifier can only be described as an adware application, which doesn’t do anything useful. On the contrary, it might wreak havoc on your computer if you accidentally get infected with it. So if your PC gets infected with it, do not hesitate toremove it immediately. System Notifier is not malicious on its own, but the content it promotes could be because it depends on what it has been programmed to advertise. If System Notifier happens to promote malicious content, it could infect your system, which will result in undesirable consequences. Please keep reading this article if you wish to know more about what System Notifier is capable of and how you can remove it. Here at Pcthreat.com we regard all adware applications as malicious, because they promote businesses and other entities unworthy of your trust. Oftentimes, adware promotes malicious infections by disguising them as Java or Adobe updates, system utility tools, and so on. System Notifier is known to display ads in the form of pop-ups, coupons, and banners. However, its advertising capabilities might be expanded with each new update. It might also utilize browser cookies to collect information about you. You should remove it because it might record clicks, browsing history, browser settings, search queries, IP addresses, and other information. Obviously System Notifier could not care less about your privacy. In fact, the developers might even provide this information to the shady businesses that they promote. It is difficult to determine all dissemination methods used by System Notifier's developers. Nevertheless, our researchers have found that System Notifier is distributed via freeware bundles. Freeware bundles can be found on websites such as Download.com, Softonic.com, Soft32.com, Cnet.com, and so on. Therefore, we encourage you to always try to opt for custom installation regardless of what software bundle you are installing. You should, at least in most cases, have a choice to decline the offer to install System Notifier when it is bundled with legitimate software. 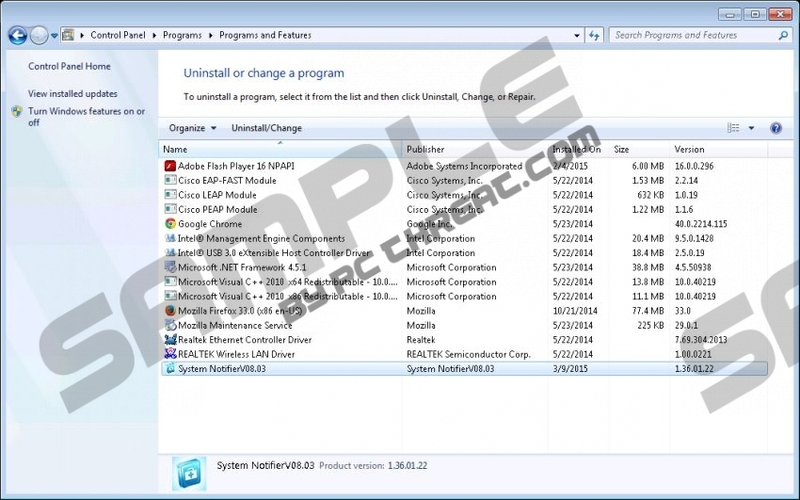 At any rate, System Notifier is an unreliable adware application that you could do without. We encourage you to remove it, because it might be programmed to display malicious content that could put your systems security in jeopardy. If you wish to avoid undesirable consequences, such as getting infected with malware, remember to always opt out of the installation of additional unknown applications when installing software bundles. If you get infected with System Notifier, do not waste any time before removing it. In the search results, go to Uninstall a program. Locate System Notifier and click Uninstall. In the dialog box, click Reset Firefox. Quick & tested solution for System Notifier removal.